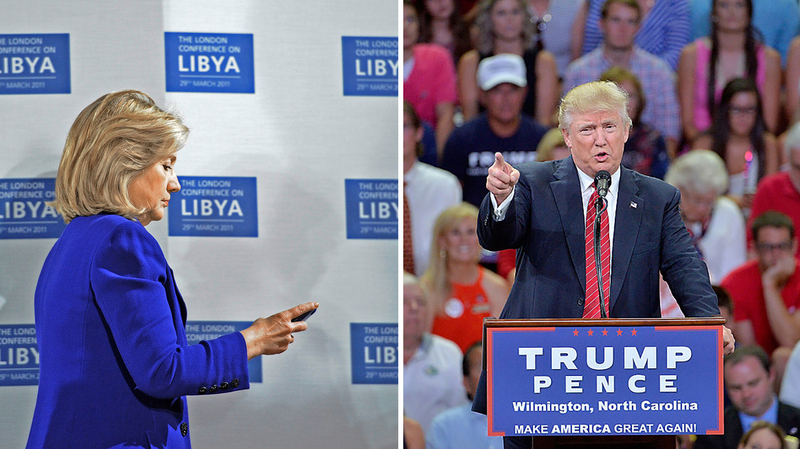 Why Are The Media Obsessed With Donald Trump's Controversies And Not Hillary Clinton's? While less than shocking by Washington standards, the latest emails between Clinton foundation and State Department staff underscore existing concerns about Hillary Clinton's ethics and transparency. It surely does seem that, at times, the news is all about Trump. This has been a common impression, and complaint, throughout the presidential campaign. In the primary season, cable news often carried Trump's boisterous rally speeches in their entirety, while other hopefuls struggled for any airtime at all. Trump's GOP rivals were exasperated at their inability to break through. More recently, the frustration has come from the Trump camp, where the old saw about there being "no bad publicity" is no longer operative. The media have feasted on Trump's feud with a Gold Star family, his invitation to Russian hackers, his rocky relations with GOP leaders, his call to uncertain actions by "Second Amendment people" and other knotty spots in the past two weeks. We have also seen exhaustive coverage of the lead Hillary Clinton has opened in national polls in the past two weeks. But in the same period, controversies touching Clinton have emerged from various sources without prompting nearly the same media fascination. Trump and some surrogates complained Wednesday that too little was made of Seddique Mateen popping up in the crowd behind Clinton at a rally in Orlando, Fla. Mateen is the father of the man who killed 49 people at an Orlando nightclub in June. The Clinton campaign said the rally was an "open door event" that Mateen had attended on his own, without the campaign's knowledge. More significant was another batch of old emails showing contacts between staffers of the Clinton foundation and State Department personnel while Clinton was secretary. The emails were released by Judicial Watch, a conservative watchdog group that has pursued the Clintons since the 1990s. The group got hold of the emails through a pending legal proceeding against Hillary Clinton. Some might find the 2009 correspondence less than shocking, at least by Washington standards. But the conversations about shared interests and agendas among people who had donated to the foundation underscore existing concerns about Clinton's ethics and transparency. Polls show that doubts about the Democrat's honesty and trustworthiness remain her biggest political albatross. The newly surfaced emails from years ago have been widely reported in the mainstream media and may continue to get substantial coverage (Judicial Watch has promised additional releases). But they were not the national soundtrack the way Trump's Second Amendment remarks were for more than 24 hours. Trump's now famous aside about Clinton appointing judges once she became president — an action he said no one could stop except maybe some "Second Amendment people" — filled the bandwidth of the news world into a second day. Liberal blogs and websites, such as Daily Kos, accused Trump of inviting mayhem not only against the Democratic nominee but against individual judges she might appoint. Federal judges have been subjected to violence far more often than most people suppose. In 2005, a federal district judge in Chicago returned home to find her husband and mother dead of gunshot wounds to the head, after she herself had earlier been targeted by a white supremacist defendant. It was hard to find anyone who had not seen the video of Trump's remarks by late Wednesday, and most folks seemed to have seen or heard them many times. 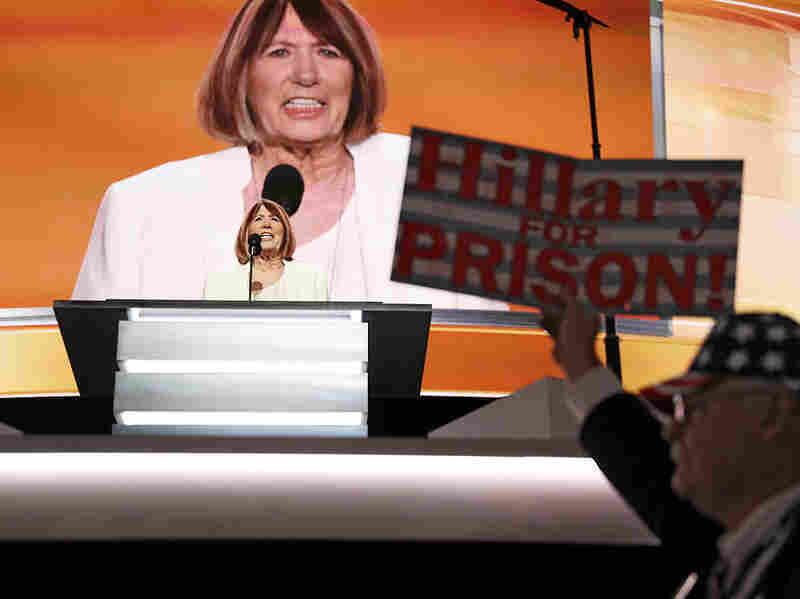 Pat Smith, the mother of an American killed in the 2012 attack on the U.S. Consulate in Benghazi, Libya, delivers a speech at the Republican National Convention July 18 in Cleveland. Also overshadowed by the Second Amendment contretemps were other allegations and Internet conspiracy theories related to the Clinton campaign. Judicial Watch's originator, Washington gadfly attorney Larry Klayman, filed suit this week on behalf of two people, including Pat Smith, the mother who spoke at the Republican National Convention about her son who died in Benghazi in 2012. The suit revisits several complaints about statements Clinton made at the time. Also this week, WikiLeaks, the self-styled watchdog of the Internet, has offered a reward to anyone who can provide information about the murder of Seth Rich, a junior staffer for the Democratic National Committee who was shot outside his home last month at 4 a.m. Police have called Rich's death a botched robbery, but the case remains unresolved. WikiLeaks was responsible for the release of thousands of DNC emails in July that showed some officials there favored Clinton over primary rival Bernie Sanders. The release immediately preceded the Democratic National Convention and contributed to divisions and resentment there. The officials have all since left the DNC. There is no evidence pointing to any Seth Rich involvement with WikiLeaks. Security experts both inside and outside the government have said the DNC hack was carried out by Russian agents. Nonetheless, in announcing the reward, WikiLeaks founder Julian Assange said his group never confirms, denies or comments on its sources. All of these Clinton stories have had at least passing mention in the mainstream media, to one extent or another. But they cannot be said to have dominated the news, even on Fox News. Certainly they have been less prominent than Trump's so-called gaffes. Let's talk about the elements of a cycle-dominating story. It needs to be timely, substantial and at least somewhat credible. It helps if it fits a well-established narrative about a candidate. And there is no substitute for a high-impact visual element — preferably live video that includes the candidate. On Wednesday afternoon, for about two hours, the only story getting any attention of any kind on cable TV news was the live video of a young man scaling the side of the Trump Tower in Manhattan using suction cups. The man was apprehended and arrested and the incident a minor distraction in the arc of 2016 coverage. Yet even for its candle-flame-brief life span upon the national stage, the climber story offered an insight into the media story of this entire year. Police grab a man scaling Trump Tower using suction cups Wednesday in New York. The climber story was human and dramatic. It played out before our very eyes on live TV. It had the suspense of wondering what would happen next, the thrill of danger and an element of mystery. "What if he falls? What is he doing this for? Shouldn't somebody stop him?" All of these are questions observers have asked about Trump himself and his unprecedented campaign. Assuming the climber wanted attention, he chose the perfect structure to scale. No building in America is more famous nor more symbolic just now than the Trump Tower, home not only to the mogul's business operations but to his presidential campaign as well. The climber in New York held audiences on all three cable TV news nets, including the ideologically opposed Fox News and MSNBC outlets. It was a story equally fascinating to all points of view. To some extent the climber story also served as a paradigm of the larger Trump phenomenon. Trump lives in the media as a riveting figure of ongoing fascination — for those who find him repugnant no less than for those who feel drawn to him. Trump is also the focus of the news more often because he is nearly always making more news — at least by our traditional journalistic definition. He says and does things that are different, that stand out, that surprise and even alter the landscape. Whether being outrageous in debates or carrying his off-the-cuff behavior to extremes in speeches, his sheer defiance of accepted norms and best political practices demands attention. 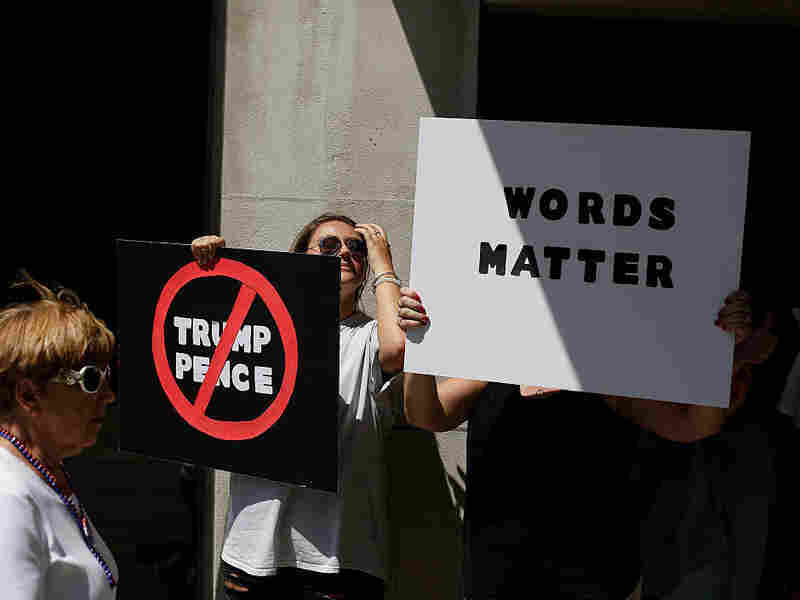 Demonstrators hold signs as they protest Republican presidential candidate Donald Trump during a Trump campaign event in Davenport, Iowa, on July 28. Trump gets the airtime, the ink and the clicks far more often than Clinton because his controversies are generated largely by his own live performances on TV for all the world to see. Witnessing his debates or speeches is far more compelling than hearing about the possible implications of old emails from another decade. And so we have all become rubberneckers, slowing down to view the car wreck as we pass it on the highway. Talking about the potential for corruption in some of Clinton's practices is serious business, but it is dull compared with watching one's daily dose of the Donald. By contrast, the implications surrounding the Clinton emails exhumed by court order are a routine species of scandal stamp-collecting. And they are the fruit of conservative activists and advocates who have been generating anti-Clinton material since her husband was president. Do they have something to say? Yes. A case to make? Yes. And it should not matter that they have been at it for a generation — often repackaging and re-marketing the same accusations with only a sprinkling of new material. It is not always a waste of time to re-plow old furrows. After all, tens of millions of young Americans who will vote this fall do not remember the scandals of the 1990s. They happened or were alleged when the millennials were in grade school. We should also say that tens of millions of American voters of all ages are just now tuning in to the 2016 election for the first time, and tens of millions more have yet to do so. So everything old can be new again — at least to someone. Still, the recycling of the email story lacks an immediate bite or sting. That is why the Seth Rich tale has been brought in to juice the original and build mystery. Anything that is new — happening on live TV right now and flooding your Twitter feed — is indisputably powerful. And that is the kind of new thing that is more likely to dominate the news.